The Ditch That Textbook Digital Summit is a 9-day FREE virtual event with practical, inspiring presentations from amazing educators. I’m excited to tell you about a great conference you can attend in your pajamas from the comfort of your own couch! In December, you can take part in the Ditch That Textbook Digital Summit. It’s an online conference that features nine presentations from educators who are doing amazing things in technology, pedagogy, inquiry and more. creators of some amazing blogs and online resources for teachers. Each presenter brings a ton of value, inspiration and encouragement. I know you’ll finish this digital summit ready to do new, exciting things in your classroom. The best part about this event? It’s totally free. No cost whatsoever. To get your free ticket to the Ditch That Textbook Digital Summit, click here or go to DitchSummit.com/ticket. A new video will be released every day from December 16-24. You’ll be able to find them on the speakers’ pages at DitchSummit.com. From December 25-31, the videos will stay visible so you can catch up with any that you miss. After December 31, the summit will be closed and the videos will disappear. It’s during winter break here in the United States, and it’s a time when many teachers recharge and get ready for a new semester (or new calendar year). The new year is a time for making new plans and setting new goals. If you’re on break, you don’t have papers to grade, classes to teach and meetings to attend! A little extra time will make this the perfect opportunity. The speaker list is unbelievable. I brainstormed some of the most inspiring, innovative educators I could imagine and asked them to be part of this event … and thankfully, pretty much everyone I asked said yes! I hope you’ll sign up, and I hope I’ll see you at the Ditch That Textbook Digital Summit starting on December 16. But I also hope that you’ll share this free event with others. There are great ideas and inspirational content in every presentation. I’d love to reach as many educators around the globe as possible! Question: Any questions about the event? What do you think about it and the presenters? You can leave a comment by clicking here. Oh my goodness, this makes me so excited!!! Do you need to watch it real time? Or can you watch it when you can? They will all be prerecorded, so watch as you can. New videos will be available every day from Dec. 16-24, and they will all remain available through Dec. 31 if you want to rewatch or catch up. How long will each video run in the Ditch That Textbook Digital Summit? Each one will be about 45 minutes (some longer, some shorter). They will all be prerecorded. Thank you so much for putting all of this together. Now I need to sort through all these fantastic ideas, start small and give it a shot. entire world, right after introducing it largely inside the U.S.
those call for a plug-in set up). 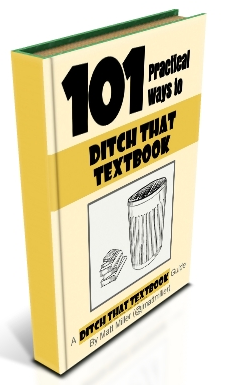 Sign up to receive my blog posts via e-mail and receive the FREE "101 Practical Ways to Ditch That Textbook" e-book! Tech Like a PIRATE! Add a techy spark to the passion, enthusiasm and flair promoted by "Teach Like a PIRATE" by Dave Burgess in this FREE EBOOK! Get your copy now! ©2019 Ditch That Textbook by Matt Miller.